Receiving a finisher’s medal has become very common lately. I have them from marathons, half iron distance triathlons, and even 5 mile races and sprint triathlons. On a wall in my guest room I have a row of teacup hooks cluttered with finisher’s medals. This past weekend I received another finisher’s medal and it is already hanging on one of the hooks – but it is by far my most meaningful medal. Most readers familiar with this blog are aware I had a very challenging 2013 with a variety of health issues. Fortunately this year has been my comeback – I have stayed healthy and my training has gone very well. On Sunday June 1st I participated in Ironman Raleigh 70.3. This race was my fifth half iron distance, but first with the Ironman brand. Before I go into the race, I would like to share a few things leading up to it. First – while this was the first race with Ironman that I participated in, it was not the first time registering for an Ironman race. In 2002 I signed up for the inaugural Ironman Wisconsin – yes the full 140.6. I had also battled with bronchitis several times durning training. After finishing the Muncie Endurathon in July (which now is Ironman Muncie 70.3, but wasn’t at the time) my doctor, who also is a triathlete, strongly recommended pulling out of Wisconsin. My body was not recovering well and it could cause more damage. I followed doctor’s orders and pulled out of the race. Last year I registered for Ironman Syracuse 70.3 and with all of my health issues once again I pulled out. I try not to be superstitious, but I can not deny I had trepidations going into Raleigh – was this going to be the year I actually earned an Ironman brand finisher’s medal? Second – my training leading up to this race was solid. My coaches prepared me very well. I am swimming faster than ever and my run has improved quite a bit as well. My bike is improving – gaining strength there after all I have been through is taking a while. I caught myself a few times when answering my friends’ questions of how did I think I would do in Raleigh. I wanted to say I am sure I would set a personal record – instead I would answer that I have it in me to PR barring any unexpected events. Sometimes I wish I wasn’t so intuitive. I chose Raleigh for a race venue after a friendly challenge with fellow blogger IowaTriBob. We picked a race location we both could drive to and race. I also have family and friends in the area and knew it would be a fun weekend. On Saturday morning I went to the athlete meeting – the race is point to point with two transitions so I wanted to make sure any questions of logistics were answered. Sitting in the meeting I thought to myself that I finally made it, I was going to finish an Ironman sponsored race. After the meeting I drove my bike out to the lake to set it up at T1 (transition 1). I planned to ride a short ride to make sure all worked well and get my legs going. After a 9 hour drive down the day before, my back was tight and I also wanted to make sure it felt good. It did. Before setting up my bike, I went for a quick shakeout run. Jordan Lake was the swim venue and the access road leading to where transition was set up was narrow with no shoulder. Many triathletes were cycling and running along the road as cars, trucks, and SUVs drove in to set up as well. I ran along the left side of the road and a larger SUV was driving toward me – it became apparent the driver was not going to move over and I didn’t want to get hit by the side mirror – so I stepped a bit to the left and my left foot came down on the edge of the asphalt. I rolled my left ankle, scraped my right knee as I fell, and heard that noise I so dread – pop. I knew I sprained my ankle. The same ankle I sprained rather severely two years ago. This time it was much more mild, but it was still a sprain. I called my coaches for advice, I texted and called friends for encouragement and prayers. In a snap – literally – my expectations changed from wanting to PR to wanting to finish. My coaches helped talk me through it – I decided to swim and ride for sure and see how I felt when it came time for the run. I could put full weight on the ankle so I knew I could stay upright without issue, how much pain I could tolerate was going to be the test. Race day – since my perspective changed I was very calm. Just get through this was my focus. Fortunately the water temperature was 75.6 degrees – below the 76.1 cut off for wetsuits. My wetsuit helped me a lot. During my practice swim that morning I felt a little strain sometimes when I kicked. During the swim leg of the race I didn’t kick as strong as I had planned and the wetsuit compensated with buoyancy. My swim went incredibly well – I swam the 1.2 miles in 40:24. I had originally wanted to break 40 minutes but with little kicking, I was very pleased. I also was 32 out of 102 women in my wave. Top third!! I took my time in transition. The plan was to wear full compression socks for added support on my ankle. Walking and not running, I got to my bike, dried off and put on the socks and my bike gear. The bike course was hilly – most of the time I didn’t feel any strain on my ankle. I know I was more cautious climbing the hills than I would have been had I not had the injury. After 56 miles I entered T2 about 20 minutes slower than I had hoped, but I made it through. Again – I took my time getting my run gear together. I needed the time not only to be gentle on my ankle but also on my mind. I was about to exit transition with a sprained ankle and attempt to run 13.1 miles. I left not knowing for sure if I was going to finish. On the run I paced myself. The first mile went much better than I expected. I ran without much pain and would walk 15 seconds every several minutes. Just before mile 2 the pain became sharper. From mile 2 through mile 5 I came close to pulling out three times. I would do a pain assessment – it hurt but I asked myself how bad? With all I went through with my health problems last year, I experienced a lot of pain. So much that there actually was one day I was not sure if I would survive the day. But I did. That day taught me I can endure far more than I used to think. My ankle pain was probably a 1 on a scale of 10 with my past experience hitting a 9. I can run/walk through that level of pain. The run course was also very hilly and a double loop. At mile 6.5 I made the turn and knew two things – 1) I had 6.5 more miles of hills ahead to cover and 2) I was going to finish regardless of how long it took. I wanted the finisher’s medal. My coach had asked me the day before how important a finisher’s medal was to me – I told him I am not that big on medals, I have many. On race day with 6.5 miles left my perspective changed. That finisher’s medal represents accomplishing a very difficult race (even when injury free) and my triumph over not completing an Ironman event. I crossed the finish line and was thrilled to have the finisher’s medal placed over my head. I cried. Instead of a PR, I was 48 seconds faster than Muncie – my slowest half iron triathlon. 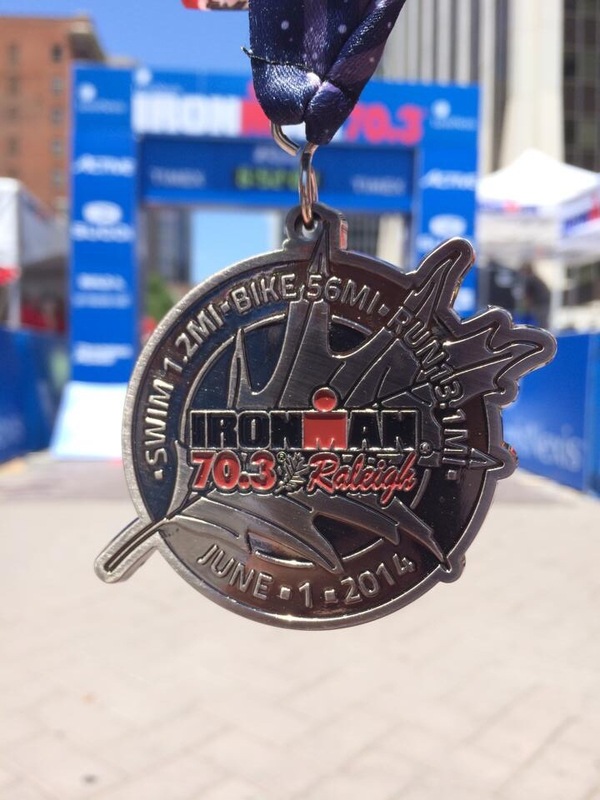 My fifth 70.3 – my true Half Ironman – was my second slowest and most meaningful. With prayer, encouragement, and trusting in my training – physical as well as mental – I accomplished something I had doubted was possible that morning. Yes, all things are possible. Enjoy some well deserved rest! Thank you!! I remember the sign!! It made me chuckle. All if the volunteers and crowd support were outstanding. I really was a great experience! That’s what I’m talking about sister! Woohoo! I think someone named Jim has been trying to convince you that you’re tougher than you give yourself credit for, for quite some time. This post does my heart good… Not because I was right but because this confirms I’m a good judge of character. Congratulations. Thank you!! Your comments mean so much! My pleasure Elisa. Now, let’s work on staying away from the edge of the asphalt, eh? LOL. Ha! I will do my best! Congrats!! What a wonderful accomplishment.